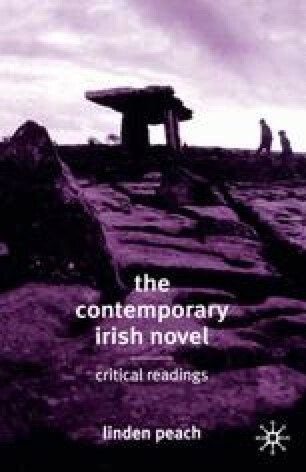 The contemporary Irish novel occupies an especially complex cultural and intellectual space where there is a strong sense of both continuity and disruption. It is a space that is similar to that which one of our leading postcolonial critics, Homi Bhabha, identifies as the ‘in-between’ space or ‘timelag’ which those who have been previously marginalized or silenced enter before they find their new identities. Of course, Irish literature itself has occupied a central position in, for example, the development of European modernism in the early twentieth century. But within Ireland and Northern Ireland, there are many groups of people who have been denied a voice and new writers who believe they speak on their behalf. In finding a voice after so long, these groups and writers find themselves in a space which is not only new to them but marked by uncertainty — an ‘in-between’ space indeed. Moreover, the subject matter of late twentieth-century Irish literature has, and is, changing despite its, sometimes self-conscious, affinity with the past. Not only are there new topics, opinions and perspectives but also much of what was once implied, at best a covert subtext, is now more overtly articulated. Two of many important questions for us to ask are: What has this done, is doing, to the wider national identity? And what is its effect on Ireland, and in different ways, Northern Ireland’s perception of themselves as part of the late modern or postmodern world? In exploring the significance of the ‘timelag’ for, and in, Irish fiction, I am especially interested in the way this concept at the end of the twentieth century has empowered a number of women writers.